The 3-1 Tennessee Titans hosted the undefeated Kansas City Chiefs Sunday in an AFC showdown featuring two of the surprise teams in the NFL. The two teams entered the game with a lot of similarities but the key differences were the ultimate game changers. Two keys I mentioned in my pre-game scouting report and match ups proved to be key indicators to the success of the winning team. The Chiefs made less mistakes and that proved to be the winning formula. The Titans obviously miss Jake Locker who has had an exceptional year but I really cannot fault Ryan Fitzpatrick’s play Sunday. He started slow which was a bit concerning but not entirely unexpected given it was his first start. Fitzpatrick’s numbers don’t reflect entirely his play but they are illustrative in a way. He went 21 of 41 for 247 yards, 1 touchdown and 2 interceptions. He also was the Titans leading rusher with 50 yards on 6 carries and a touchdown. The Titans inability to get the run game going on a consistent basis with Chris Johnson and Jackie Battle really hurt them this game. This is an ongoing theme and the curve is trending in the wrong direction. The Titans have to fix their run game issues and quickly. Chris Johnson carried the ball 10 times for 17 yards and finished the game with a 1.7 YPC average. Johnson was on the field for 53 snaps while Jackie Battle played 17 snaps. Battle would rush 6 times for 38 yards and finish with a 6.3 yards per carry average. The Titans offensive line struggled to open lanes in Sunday’s game although I do believe they were better this week in pass protection. Fitzpatrick was sacked 3 times in the game. The Titans chose to rush Battle on a 4th and 1 at the Chiefs one yard line and he was stuffed. I liked the call it was gutsy and Battle was coming off a big run where he really hit an open lane. It just wasn’t executed very well. The Chiefs were able to mount a 10 play 94 yard march but it only resulted in a field goal. Still, it is troubling to think the Titans couldn’t pick up that one yard. Full back Collin Mooney was in the lineup along with tight ends Delanie Walker, Craig Stevens and Taylor Thompson. At wide receiver the obvious story is Kenny Britt and his drop filled day. Britt was targeted 6 times Sunday and managed only 1 reception for 9 yards. After re-watching the targets repeatedly, I believe only one of those drops was more on the quarterback than the receiver. It was a long pass intended for Britt on the right sideline at around 7:35 in the second half. The ball was just a bit in front of Britt and he was unable to bring it in. The other targets were good throws by Fitzpatrick and Britt has to make those catches. One of the most troubling drops occurred in the third quarter at roughly the 7:34 mark. The Titans were on the goal line and Britt dropped a touchdown pass in the left corner of the end zone while being held by Sean Smith. As a side note, Smith held Justin Hunter on the next throw in the exact same spot. Regardless, the ball hit Britt squarely in the hands and he absolutely has to make that catch. The Titans would walk away with only 3 points. The second of the big drops would happen in the 4th quarter at approximately the 11:45 mark. The Titans have it 3 and 1 at their own 44 line. Fitzpatrick puts a pass right between Britt’s numbers and he drops it as he is going down. Not only does this drop kill a drive but the Titans are still in the at 17 with the Chiefs trailing by 13. After the Titans go 3 and out, their 6th in the game, the Chiefs mount a 10 play 66 yard drive that culminates in a Jamaal Charles rushing touchdown. The next 2 Titans drives are a disaster but Britt isn’t even on the field for those. Justin Hunter would finish the game at that point for the Titans. The Titans are currently accessing the role Britt will play going forward, and Munchak publicly continues to express support for Britt, but I think it’s certain Britt’s role will continue to diminish while the Titans continue to work second round pick Justin Hunter into the mix. Unfortunately for the Titans, they travel to Seattle this weekend to take on the Seahawks and their stifling defense. It is doubtful they want to throw too much at Hunter in that type environment. Still, I think you can expect to see him play in packages while Britt remains on the field in run situations. Despite some costly penalties there, Britt is a very good run blocker when he chooses to be and right now that’s his easy ticket to remain on the field. He didn’t commit a costly penalty Sunday so there is that good news. Britt has 5 penalties on the year while he only has 6 receptions for 52 yards. Kendall Wright led the Titans receivers in this game with 6 catches for 74 yards. He and fellow wide receiver Nate Washington need to be better jobs helping their quarterback out as they both allowed interceptions to be made over them while they were trying to make a play. This is an area where tight end Delanie Walker really excels. He had 4 catches for 43 yards and came very close to scoring on a 14 yard pass from Fitzpatrick deep in the third quarter. On the defensive side of the ball the Titans were very good and the defense kept them in this game. 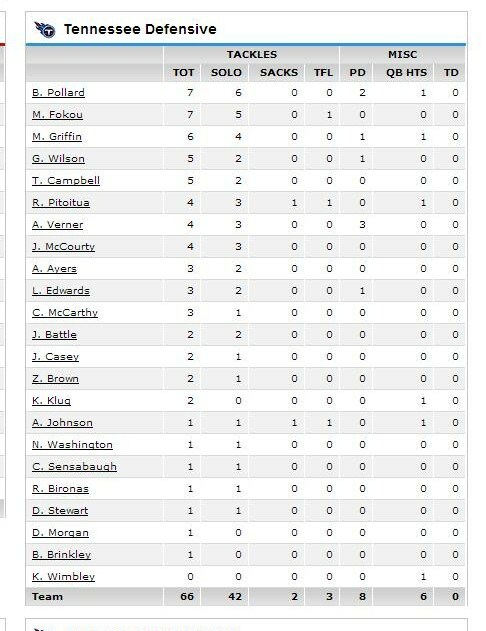 Safety Bernard Pollard led the team in tackles once again with 7 sackles, 6 of them solo, 2 passes defended, a quarterback hit and an interception. The Titans secondary is playing very well and Alterraun Verner continues to shine though I’m sure he would love to have a couple of plays back where he missed out on interceptions. Free safety Michael Griffin continues to play very well and he finished with 6 tackles, a pass defensed and a quarterback hit. Nickel back Coty Sensabaugh left the game with a concussion and the Titans brought Tommie Campbell in to play right cornerback moving Verner to the nickel spot. It worked out well and I thought Campbell did a nice job. Still, you would like to see Sensabaugh back next Sunday and it does not appear he will miss the game. We will keep an eye on that injury situation. On the defensive line, Derrick Morgan was banged up and left with an elbow injury. He was scheduled to have an MRI today but the results have not been released. Rookie defensive lineman Lavar Edwards got some significant playing time Sunday (30 snaps) and had a really nice game with 3 tackles and a batted pass. Ropati Pitoitua and Antonio Johnson both had a tackle for a loss and a sack. Defensive end Kam Wimbley’s presence continues to make itself known though it doesn’t always show up in the stat line. He put pressure on Alex Smith early in the 4th quarter on a third down play allowing the Titans to get the ball back. Linebacker Akeem Ayers continues to see time at defensive end and he just keeps getting better there. Zaviar Gooden tweaked his hamstring again and left the game early so that will need to be watched. Linebacker Zach Brown went down with a right knee injury but returned to the game and is expected to play this Sunday in Seattle. Patrick Bailey also left the game Sunday with a hamstring issue. Middle linebacker Moise Fokou had a controversial personal foul penalty on the 4th quarter drive where Jamaal Charles scored that has been the subject of debate. Quarterback Alex Smith was running down the sidelines and was still in bounds when Fokou laid a big hit on him knocking him out of bounds. The announcer on the play is quite correct in saying that Smith was a runner and he is fair game on being tackled. He is also correct in pointing out that Fokou made his move to knock Smith out of bounds while he was clearly running to pick up the first down. Fokou himself now says it was a judgment call and could have gone either way. Hard to blame him for not wanting to be labeled and targeted but it was a bad call. The worst part about it was that Smith didn’t pick up the first down on his own but had to get help from the officials. Finally, special team issues once again raised their ugly head, this time with a decision by Darius Reynaud not to field a punt when he probably should have. The ball bounced off Damian Williams leg and was recovered by the Chiefs in the end zone for a touchdown. Reynaud also brought a couple of kickoffs out which was a questionable decision and the Titans started at their own 18 yard line both times. Mike Munchak chose to try a 32 yard field goal down 26 to 17 with 2 seconds left and Rob Bironas missed it. 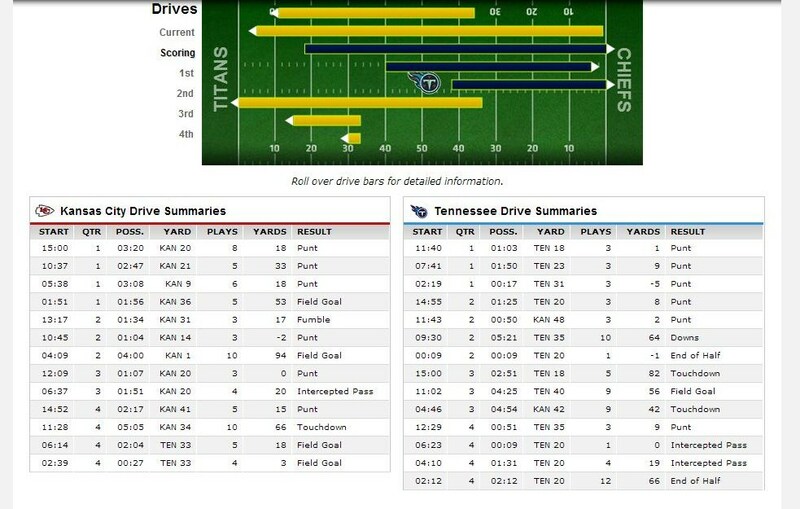 The Titans and the Chiefs finish the game virtually even in all categories with the exception of the Chiefs special teams score and the additional interception. Obviously, the stuff on 4 and 1 on the Chiefs goal line was a big play as well. The personal foul penalty was rough but for me the worst penalties were the ones against the Chiefs that were not called especially the defensive pass interference plays that went unflagged. The Chiefs were able to run the ball better and ultimately just made less mistakes than the Titans and that made the difference. Previous Scouting the Enemy – How Do the Titans and the Chiefs Match Up?